Have you read The Jesus I Never Knew by Philip Yancey? It’s a book which reveals characteristics of Jesus most people miss. I don’t agree with everything in the book, but one thing it does is make you think about who Jesus really was and what He really did. When we think of him that way, in our most honest moments, we think that while it would have been nice to be back there and hear some of His teaching, see some of His parables, and go ask him that theological question that’s always been bothering us — if we’re honest with ourselves, we’re not sure he’s really the kind of guy we would want to hang out with. If we’re having a Superbowl party, we don’t imagine it would be the kind of activity he would want to come to. When you invite some guys over to your house to shoot some pool and shoot the breeze, and joke a little about work and the weather guy, you tend to think that if Jesus was there, he’d want you all to be quiet and somber so He could tell you a confusing story about a two landowners. I’m not trying to be sacrilegious or disrespectful to Jesus. But I think this is the way most men view Jesus. A killjoy. A man who never smiled and never had fun. A man who rarely joked. A man who everybody says is a good teacher, but in all honesty, when you read His teachings, most of them don’t make much sense. Philip Yancey’s book was one of the books that helped launch me into a whole new way of viewing Jesus the way Scripture really portrays Him. But in the ten years since I read that book, I have found a few other characteristics, or traits, or practices of Jesus which Yancey overlooked, and which has made Him come alive to me in a whole new way when I read the Gospels. There were three keys to Christ which I learned in Luke which gave me a whole new picture about Christ. For me, these three keys made me see Christ in a while new way in Scripture. These helped me understand what Christ was all about, and explained why He did what He did. And as I understand Him more, that makes me more excited to learn about Him in Scripture, talk about Him with others, and hang out with Him as a friend. The first items we are talking about is the teaching style of Christ. Not a particularly exciting element to Christ’s character, but I think that it is something every single Christian should be aware of about Christ. So what do you think? What is the primary teaching method, the primary teaching style of Christ? Parables, right? Parables. That is the answer that everybody gives. That is what everybody thinks. In fact, one of my seminary classes was taught by the president of the seminary, and in the class he told us he did his doctorate work on the parables of Christ, and said that parables were the primary teaching method of Jesus. We will be looking at the parables of Jesus in a later message, because there is something about the parables that most Christians miss as well. Thankfully, the seminary president did not miss this element of parables, and even mentioned it in class. We’ll talk about that tomorrow. But would it shock you if I told you that parables were not Christ’s primary teaching style? There is a form of teaching that Christ was involved in much more frequently than teaching in parables. The reason most Christians miss this aspect of Christ is that the Gospels don’t say much about it. But there are clues; there are hints for the careful reader. We have some of them in Luke 4. Let me state a few personal convictions about preaching and teaching. I believe in expository preaching. That is, I believe the primary way the Bible should be taught is book by book, chapter by chapter, verse by verse. But one thing that always bothered me was that if I believed that expository preaching was the way it should be done, why didn’t Christ preach that way? Why did He use little stories and parables and anecdotes? You know what people say: “Since Jesus used parables, so should we.” Again, we’ll talk about parables tomorrow. But my problem was that if expository preaching was the way to teach the Bible, why didn’t Jesus teach it? We could even go before the time of Christ and go back, for example, to Nehemiah 8, and see that when Ezra wants to teach the people the Word of God, he gathers the people, and then he and several other Levites took turns reading from Scripture and explaining what it meant. The only way to understand this is that they would read a few verses, and then explain what it meant and apply it to the lives of those listening. In essence, that is expository preaching. We see Isaiah talk about this kind of teaching in Isaiah 28. So we have expository preaching before Christ and we have it after Christ. I always wondered why we didn’t see Christ doing it? If it is the way God intended His Word to be taught, how come Christ didn’t teach it that way? How come He used parables? That is what I thought. And then I saw something in Luke 4 I had never seen before. 14Then Jesus returned in the power of the Spirit to Galilee, and news of Him went out through all the surrounding region. Nothing too surprising or new here. News of Him is spreading throughout the entire region. This is partly because of the miracles He is performing. But the jolt comes in Luke 4:15-16. Luke 4:15-16. And He taught in their synagogues, being glorified by all. So He came to Nazareth where He had been brought up. And as His custom was, He went into the Synagogue on the Sabbath day, and stood up to read. Now skip down to Luke 4:32. Luke 4:44. And He was preaching in the synagogues of Galilee. Four times in Luke 4, we are told that Christ preached in the synagogue on the Sabbath. And verse 16 was very adamant that this was his custom. This is what He did week in and week out. “Big deal,” some say. So every Sabbath, he goes into the Synagogue and tells a few parables, heals a few people, just like he always does when we read of Jesus teaching. But wait, most of the recorded teachings of Jesus do not take place on the Sabbath. As you read through the Gospels, I want you to note that most of what is recorded in the Gospels takes place on a weekday as Jesus and his disciples are sharing a meal with someone, or walking from one place to another. Most of the recorded teaching of Scripture in Jesus is dinner time conversation or travel talk. 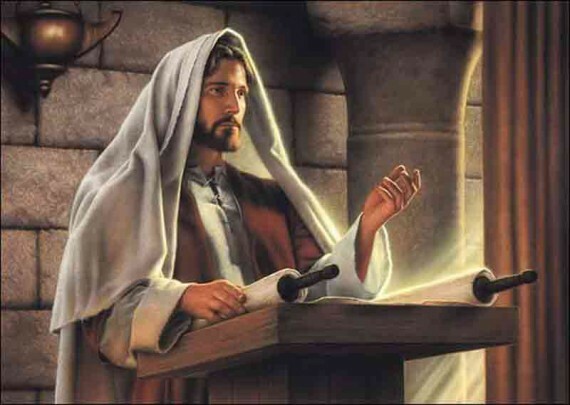 But four times in Luke 4 we read that it was His habit, it was His custom, every week that went by, week in and week out, Jesus was in the Synagogue on the Sabbath, teaching. (We read about him teaching in the synagogue in many other places as well, and the apostles also .) And what was He teaching? Look back up at Luke 4:16. But why does Luke the historian give us such detail? For two reasons. First, Christ’s actions here are parallel to Ezra’s actions in Nehemiah 8, and the actions of Moses at various places in the Pentateuch. Christ was following the Old Testament pattern of teaching the Word by reading it, then explaining it. Secondly, though, Luke, the detail oriented physician/historian wants to show us how Christ normally taught. You see, what got recorded in the Gospels are the abnormal teachings. The things that made Him unique and different than the other teachers. But Luke wants us to know that normally, Christ could be found in the local synagogue, on the Sabbath, teaching and preaching the Word of God. Let’s talk about the synagogue first. There only needed to be ten faithful Jewish men to attend and support a synagogue in order to start one, and so nearly every town had at least one synagogue. Some of the larger cities had quite a few synagogues. For example, Jerusalem had over 400 synagogues at the time of Christ. Jews had the temple in Jerusalem, but they only went there a few times a year. The synagogue was where they gathered on the Sabbath. And not just on the Sabbath, but much more frequently for some of them. Why? The synagogue existed for one purpose only: to teach the Word of God. Men went for one purpose only: to hear the Word of God taught. All good Jewish men went weekly, if not daily, to the synagogue to learn the Bible. Sometimes, rather than call them Synagogues, they were referred to as a “school” or “House of Instruction.” The synagogue was the local religious school where Jews went as often as they could to learn the Word of God. And it really was more like a school than anything else. Those who were able would gather three days a week—on the Sabbath, which is Saturday, and then also after work on Monday and Thursday. The goal of all three meetings was to teach the entire Word of God. On the Sabbath, they taught the Bible in such a way so that the Penteteuch, which is what we call the first five books of the Bible, was taught straight through every three and a half years. On Monday and Thursday, they would cover the rest of the Old Testament in that same time period. No, actually, they didn’t have short sermons, they had long services. The Sabbath day was for rest and reflecting on God’s Word. And so, the services could take up much of the day. 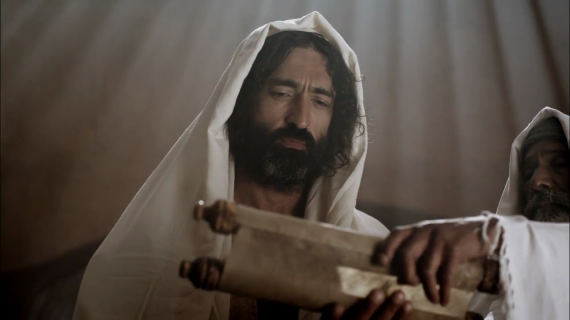 But notice that here in Luke 4:17, Jesus reads and teaches from the scroll of Isaiah. If the Sabbath was reserved for teaching from the Pentateuch, how is Jesus teaching from Isaiah on the Sabbath? Sometimes, the seven sermons from the Pentateuch would go shorter than expected, or the men were just loving hearing the Word taught so much, they said, “Encore! Keep preaching!” and so a favorite teacher might be called on to teach an additional passage of Scripture. And historians also tell us how the daily lessons were presented. They explain that after the text was selected, the teacher would stand and read it, then sit and explain it. What is Luke telling us here in chapter 4? That Jesus was a favorite teacher in the Synagogue, and week in and week out, He would go to the local synagogue of the city he was in, and read a passage of Scripture, then explain that passage of Scripture. Certainly, if he was in a certain place for a long time, he may even join the rotation of speakers for the seven Sabbath sermons, and maybe even for the Monday and Thursday gatherings as well. Christ’s primary method of preaching was expository. He preached the Word, book by book, line by line, precept upon precept (cf. Isaiah 28:10-13). Now again, notice that since Christ was preaching from Isaiah on the Sabbath, this means He was one of the favorite teachers. I wish I could have some of these expository sermons. I wish I could have Christ’s Thru the Bible sermons on mp3. That is one of the things I’m looking forward to heaven for. I want to listen to Jesus teach the Word. The Word teaching the Word. But why was Christ’s expository teaching so popular? Luke gives us three reasons in Luke 4:22-32. First, in Luke 4:22, He spoke graciously. He did not speak harshly. He did not teach the Word arrogantly. He did not speak as a “know it all” – even though He truly did know it all. Second, from Luke 4:28, he was not afraid of offending the elite. The religious leaders heard what Jesus was saying, and they were filled with wrath. We could probably add into this not just the religious leaders, but the rich, the famous, and the powerful. We have all known churches and pastors that beat around the bush when it comes to possibly correcting or confronting those who are in power. But Jesus didn’t beat around the bush. Yes, He spoke graciously, but He doesn’t let that keep Him from saying what needs to be said. All of us need correction from time to time – even religious leaders – but they are the ones who often take it the worst, because they have been trying to show they have it all together, or they don’t like to admit they were wrong. The first two things that made Jesus a popular teacher I like to think of as the teaching twins. In the Gospel of John, we read that Jesus was full of grace and truth (John 1:14). That’s what we see here, isn’t it? In Ephesians, when Paul tells the pastor-teachers how to equip the saints, he tells them to teach the truth in love (Eph 4:15). There it is again. Teach the truth, but teach it in love. Those are the first two characteristics of Christ’s teaching style. The third one is in Luke 4:32: He spoke with authority. Elsewhere, the teaching style of Jesus is contrasted with that of the scribes and teachers of the law (Matthew 7:28-29). The scribes and teachers of the law, when they got up to teach the Bible, most often said a bunch of nothing. T they would read a passage from Scripture, just like Jesus did, but then, instead of explain it, they would just start quoting other teachers. And basically, when they were done, all they had done was tell people what the various big name teachers and commentators had said about the passage. Oftentimes these teachers and writers contradicted each other, and so nobody ever really learned what the passage truly meant. All they got were a bunch of man made opinions on the passage which conflicted with one another. And the people were astonished at this teaching because they understood it. They marveled at it, because it was so simple. It was authoritative because it was the unadulterated Word of God. When you graciously teach the truth of the Word of God with the authority that it demands, people will not be able to get enough of it. Look at Luke 5:1. Despite what church growth guru’s today say, despite the opinion polls and the neighborhood surveys, people want to hear the Word of God. They may not know it, but when they hear it, their soul sings. Gracious, truthful, authoritative, Biblical, expository preaching is like a breath of fresh air after coming up out of the sewer, or a drink of water to a parched tongue. I have two girls. If I asked them if they want candy and chips or green beans and chicken for dinner, which one will they pick? That’s right. They will choose what is bad for them. When churches allow non Christians or baby Christians to pick what they want to hear on a Sunday morning, they are allowing them to pick what is bad for them. Pastors and elders need to take a cue from Jesus and from Scripture, that expository preaching is what we are going to do, because expository preaching is what Christians need for growth. The reason I am so passionate about this is because I love the church. But I ache to see where the average Christian decides to attend church. And on Sunday morning, these churches serve up nothing but cotton candy and potato chips for the people that come. And they justify it all by saying, “Jesus told stories, so we should too.” Spread the Word because Jesus preached the Word. Does this effect how you view Christ in the Gospels? And what we as the church should be doing? You bet it does. First, He was a student of the Word Himself. At twelve years old, He was in astounding the teachers at the temple. That’s like going to Dallas Seminary and telling all the professors how foolish they are because they don’t know the Word. Second, though, it was Christ’s custom to be in the synagogue on the Sabbath. The cultural parallel for us is church on Sundays. And not just any church, but a church that preaches the Word. If you are attending a church that teaches the Bible, book by book, verse by verse, that is perfect. Stay there. Now if, may it never happen, and your pastor has to resign or retire, you make sure the elders pick a pastor who will preach the Word. So many churches lose an expository pastor, and then bring in some guy who has a lot of charisma, or he’s published a few books, or he is great at fundraising. And do you want to know what happens? The church gets lots of people and lots of money, and lots of fame, and lots of buildings, and lots of recognition. But all those people live weak and empty lives because they are not getting a regular diet of the meat of the Word of God. Third, Christ showed His disciples the importance of hearing the Word of God taught. And I beg you to do this, I plead with you, teach those whom you disciple—whether it is other men in church, or your wife or your children, how to pick a church. Tell them that there are two things to look for in a church. One, do they have the gospel right? Do they teach that a person receives eternal life simply and only by faith in Jesus Christ? And secondly, do they teach the Word, book by book, chapter by chapter, verse by verse? I threw the Gospel in there because there are some churches today that preach the Word, but are way off on the Gospel. They don’t preach faith alone in Christ alone. At seminary, I talk with students and ask them where they are going to church and why, and so far, I have only met two other students – and I’ve probably asked fifty students so far – I’ve only met two other students who are looking for a church that is right on the gospel and preaches the Word. And they were students who grew up in a church that preached the Word and taught them how important it was. All the other students look for a church with good music, or the one with the most activities they are interested in, or the one that’s most conveniently located. I did talk with one other student who picked a church for the pastor’s teaching, but I listened to this pastor’s sermons online, and it was nothing but fluff and stories. He mentioned Scripture only in passing. His sermon could have been given at the Kiwanis Club. Teach the people of your church the value and importance of expository preaching. If it was good enough for Jesus, it’s good enough for me. Luke 4:16ff, Luke 6:6ff, Luke 13:10ff and many other places. This is also the pattern that the early church followed (Acts 2:42), and what Paul followed (Acts 13:13ff; 14:1ff; 15:21, 18:4, etc.). The following synagogue facts are taken from Alfred Edersheim, Sketches of Jewish Social Life, p. 229-255. The Jesus I Never Knew was a big help to me along with Paul Coughlin’s No More Christian Nice Guy which gave me a even MORE different view of Jesus. I have not read Coughlin’s book, though it sounds good. That Jesus was an expository preacher is a stretch and, IMO, bad exposition. On the other hand, Jesus himself IS exposition. I really think expository preaching is an idol worshipped in evangelical churches. Reading a scripture and saying you’re the fulfillment of the scripture doesn’t sound expository. That’s the inert danger of expository preaching it relies heavily on the knowledge of the preacher and can survive without Christ. It is an end on itself. That’s different from what Jesus said his preaching philosophy was, “I only say what the Father said and do what he does.” Expository preaching on the other hand says I will say what I have discovered in my thorough study. I agree with your comment about what expository preaching as become. I think you may have missed my point re: Jesus being exposition. Exposition of scripture by definition is explanatory… it’s simply an explanation of what is written. Because Jesus is the Word made Flesh, the exact imprint and character of God… formerly hidden, now made known. Jesus, the God/Man… homoousios to patri… IS in his very person… the explanation of what is written, therefore, He is exposition. So you’re saying Jesus never studied the scriptures and therefore wasn’t teaching out of his interpretation of them? How do you think Jesus came to an understanding that scripture was speaking about him without a knowledge of what God had already said? How was he able to answer the teachers (Lk.2.46-47) if he didn’t know what they were talking about? And how would he know that unless he had read or heard it? What was his explanation, on the way to Emmaus, of “what was said in all the Scriptures concerning himself” (Lk.24.27) if not exposition? And how would he be able to do that if he didn’t ‘rely heavily’ on his knowledge of what those things meant? Your understanding of how Jesus said and did only what the Father told him implies that every word and act of his stemmed from his receipt of a divine word of knowledge. It effectively minimizes Jesus’ humanity. Not saying expository is the only way to preach, nor failing to see the validity of your point. But I go to a church where the preaching is essentially: tell a story (preferably humorous), tie that to a verse somewhere, make sure people leave feeling uplifted. It’s boring, infantile, lacks transformative power, and teaches me nothing. But it makes me feel all warm and fuzzy inside, and that’s the most important thing. Personally, I’d be quite happy to hear someone tell me their understanding of a passage of scripture. For once I’d like to hear from the pulpit truth that someone who has spent time with God has come to understand, and is now convinced of. I might disagree with it but at least it would get me pondering the real meaning of the passage. For now, I have to put up with anecdotes and performance art. God help us if that’s all the church has for the next generation. There is room for both the topical and the expository. Jesus did most of His teaching outside the Synagogue, in the streets as it were and He used parables to relate a Biblical concept. For anyone to say one way or the other is the only way (Not that you are saying this), sounds like the ridiculous KJV debate. I use both methods and I can say this, whenever, I do the expository, I spend time putting into terms people can understand and use illustrations to further get the point across. It’s all Topical, when it leaves our lips. All I know, is His Word never returns void.